If you are still working your way through your Christmas shopping and wondering what to get your favorite Catholic friend or relative (or even yourself), you might appreciate this list of Catholic gift items we've enjoyed giving and receiving throughout the year. 10. Good Deed Beads - Based on Saint Therese of Lisieux's belief in small personal sacrifice, these stunning prayer bracelets may be used to count the times each day either that a temptation is rejected, or a positive step taken toward becoming the person you were created to be. They are available for men and women, adults and children. 9. "Alive Again" CD by Matt Maher - This newest CD from rising Catholic Christian singer, Matt Maher, gives you the best of both worlds, beautiful songs with powerful lyrics that brings you to a closer relationship with God. One listen and you will be hooked. 8. Last Supper picture or wall plaque - What dining room is complete without a glorious picture of the Last Supper? Our friends over at The Catholic Company have over 100 beautiful Last Supper items to choose from. 7. Faith and Family Magazine Subscription - Families, and Moms in particular, need support and encouragement from one another when their children are in the home. This beautiful magazine offers faith-filled advice on parenting, marriage, financial planning and fun. 6. Madonna and Child Earrings - from On This Day Designs Jewelry - You will be super-impressed with these beautiful hand-crafted designs at reasonable prices. A beautiful way to celebrate your faith through your jewelry. On This Day Designs has a little bit for all - women, children and even men. 5. 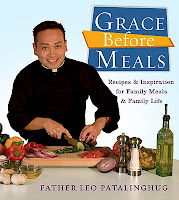 Grace Before Meals Cookbook - More than just a cookbook, Father Leo Patalinghug wants to bring families together around the dinner table together to nourish themselves with both healthy food and faith. Enjoy recipes co-mingled with scripture references and parenting tips. This edition also includes Father Leo's Fusion Fajita recipe that defeated Bobby Flay on Throwdown last year. 4. Fireproof Movie and The Love Dare Book - No other movie will have a greater impact on your marriage than Fireproof. You will recognize yourself in ways you never considered, leading to deep consideration of how you love and treat those around you. The Love Dare book allows you to implement the same concepts and ideas within your own family, strengthening your relationships with your spouse and others. 3. Joshua 24:15 Door Knocker - A beautiful adornment to your home from Aquinas & More telling all who enter that you embrace and live your faith. 2. Rosary Miracle Prayer App - by Pauline Books and Media - With inspirational pictures, scripture meditation for deeper prayer and a music selection for personalized prayer, this truly beautiful tool helps to focus your daily prayer and reflection. 1. Catholic Foodie Coffee - It could be a sin not to mention all the great things going on over at Catholic Foodie, especially his new Morning Offering Blend of speciality coffee. Surprise your favorite coffee drinker with this special blend of Arabica beans hand-roasted every Tuesday in Covington, Louisiana (across Lake Pontchartrain from New Orleans), and shipped to you on Wednesday. Pick up a Catholic Foodie mug to complete the perfect gift.